Versace belt in floral-print leather. Golden Medusa head buckle. Double keeper strap. Adjustable fit. Made in Italy. Versace belt in scroll print leather. Golden Medusa head buckle. Double keeper strap. Adjustable fit. Made in Italy. Versace belt in tabloid-print leather. Silvertone Medusa head buckle. Double keeper strap. Adjustable fit. Made in Italy. 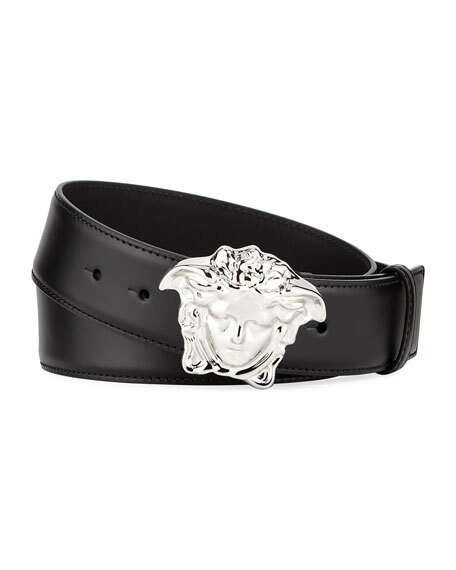 Versace calf leather belt. Approx. 1.5"W. 3D golden Medusa head tab buckle. Five-hole adjustment. Made in Italy.